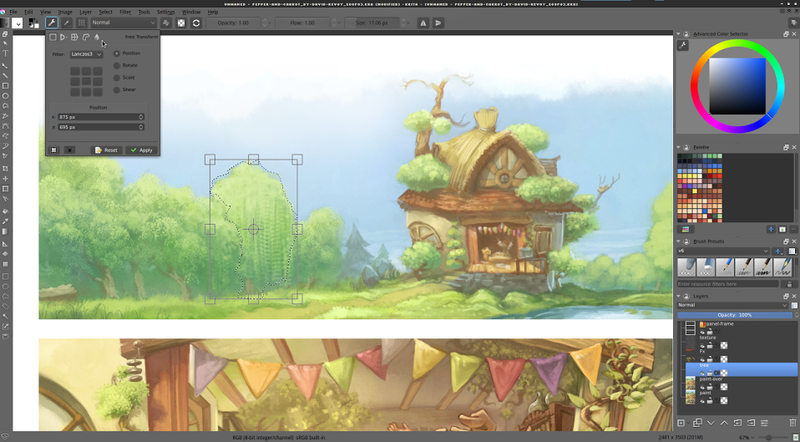 After a month of bugfixing, we give you Krita 2.9.6! With lots of bugfixes, but bugfixes aren’t the only thing in 2.9.6, we also have a few new features! selection mode to something else but replace). These don’t work with the path tool yet, and aren’t configurable, but we’re going to work on that. Check out the manual page for the selection tools for more information on how this relates to constraint and from center for the rectangle and ellipse select. Also new: Continuous transform and crop! Now, when you applied a transform or crop, and directly afterwards click on the canvas, Krita will recall the previous transform or crop, and allow you to adjust that instead! If you press ‘esc’ when in this ‘continuous mode’, Krita will forget the continuous transform, and allow you to start a new one. By default it’s still a docker, but you can configure it in settings->configure Krita->general. You can also easily summon this menu with the ‘\’ key! And Thorsten Zachmann has improved the speed of all the color adjustment filters, often by a factor of four or more. BUG:348451 Fix internal brush name of LJF smoke. BUG:348887 Disable autoscroll for the fill-tool as well. BUG:348914 Rename the fill layers. The download page has been updated, so check out the new builds. If you don’t want to use the MSI installer, go to files.kde.org for the portable zip-file based version of Krita for Windows. You can also get the latest version of Krita on Steam, using the “Desktop29” option in the Beta channel! Steam users get updates automatically.